There is neither Jew nor Gentile, neither slave nor free, nor is there male and female, for you are all one in Christ Jesus. “We love to dichotomize. Good versus bad. Heroes versus villains. My country versus the rest. Dividing the world into two distinct sides is simple and intuitive, and also dramatic because it implies conflict, and we do it without thinking, all the time. In Paul’s letter to the believers in the region of ancient Galatia he finds himself struggling to keep Jesus’ followers from falling back into their gap instincts. One of the marks of Jesus’ teaching and the believers of the early Jesus Movement was that they bridged long-held gaps between people. In Jesus, there were no distinctions. Everyone was welcome at the table regardless of gender, race, background, history, or socio-economic standing. Now, in Paul’s absence, some Jewish legalists claiming to be followers of Jesus have begun to rebuild the distinctions. Primarily, they were teaching that if a person wanted to follow Jesus they would have to follow all the old rules and regulations of the Jewish law and customs. Gentiles who wanted to follow Jesus could only do so through being a good Jew. With it, all the old gaps, distinctions, and differences would be firmly back in place. So in Christ Jesus you are all children of God through faith, for all of you who were baptized into Christ have clothed yourselves with Christ. There is neither Jew nor Gentile, neither slave nor free, nor is there male and female, for you are all one in Christ Jesus. In the quiet this morning I’ve been examining my own heart and looking for my own person gap instincts. Where have I set up distinctions in my own mind? Who’s in and who’s out? Who’s acceptable and who’s not? Who is wrong where I am right? Who is the sinner on the opposite side of my (self-)righteousness? Lord, have mercy on me. Tear down the distinctions routinely I make with my own gap instincts. Renew my mind. Help me see as you see, think as you think. If you’ve gotten anything at all out of following Christ, if his love has made any difference in your life, if being in a community of the Spirit means anything to you, if you have a heart, if you care— then do me a favor: Agree with each other, love each other, be deep-spirited friends. Don’t push your way to the front; don’t sweet-talk your way to the top. Put yourself aside, and help others get ahead. Don’t be obsessed with getting your own advantage. Forget yourselves long enough to lend a helping hand. Think of yourselves the way Christ Jesus thought of himself. He had equal status with God but didn’t think so much of himself that he had to cling to the advantages of that status no matter what. Not at all. When the time came, he set aside the privileges of deity and took on the status of a slave, became human!Having become human, he stayed human. It was an incredibly humbling process. He didn’t claim special privileges. Instead, he lived a selfless, obedient life and then died a selfless, obedient death—and the worst kind of death at that—a crucifixion. Have a great day, my friend. If you need me today, you’ll find me over there bridging some of my gaps. As I read through these words from this morning’s chapter, I was reminded of the British war time posters that have become all the rage in recent years. 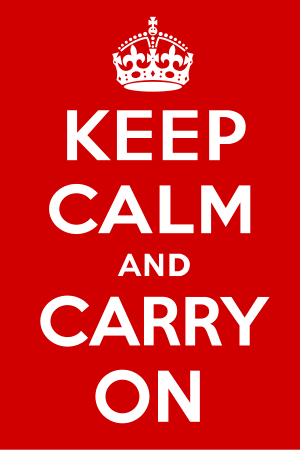 Millions of the posters, which simply state “Keep Calm and Carry On” were made by the British Ministry of Information in 1939 to boost morale during World War II, but for an unknown reason the posters were only distributed in limited numbers and were little known. In 2000, the posters were rediscovered and have become a popular theme on all sorts of products and parodies. Perhaps it’s the coupling of two simple commands that made my brain make the connection. “Think clearly and practice self-control” is just as relevant an admonishment in times of war or peace. It’s worthy of daily reminder. We are bombarded with so much information and misinformation on a daily basis from an increasing number of media outlets and apps. Clear thinking is not always an easy task in the midst of it. Our chapter-a-day journey is one way that I try to feed my thinking with eternal, spiritual truths rather than momentary sound bytes. The daily perspective from God’s Message helps my mind and soul cut through the glut of useless and temporal noise. Exercising self-control is an equally important command worthy of daily reminder. Wendy and I have been doing a lot of thinking about and discussion around the idea of appetites recently. A few weeks ago we spent a drive to Des Moines talking about the traditional “seven deadly sins” (lust, gluttony, wrath, sloth, pride, greed, envy) and made the observation that each of the “sins” are natural human appetites out of control. Likewise, the result of each is destructive to both self, intimacy with God and intimacy with others. Our journey towards maturity, wisdom and spiritual wholeness requires an ever and increasing measure of self-control over our human appetites and inclinations.